Discover Seabourn’s serene Uncommon Caribbean at Soper’s Hole and Iles des Saintes, plus Caviar in the Surf at unspoiled Mayreau. * All prices quoted are PER PERSON in Australian Dollars and include taxes, fees and port expenses (if applicable). 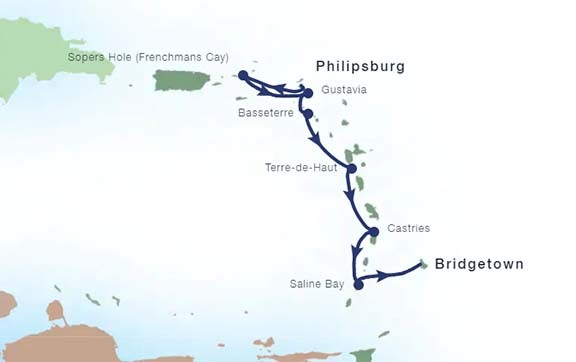 All prices quoted are for the cruise departing on 14Dec19. Prices for alternative departure dates may vary. Gratuities included. Aboard Seabourn Odyssey, you’ll discover an ambiance that is relaxed and casual, elegant and unassuming with the distinctive silhouette and signature features that are ours alone. Paired with an exclusive intimacy and true sense of camaraderie that is so treasured by Seabourn guests. 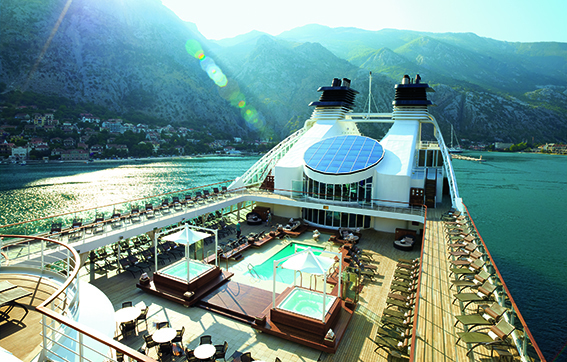 Designed by Yran & Storbraaten, the world’s foremost architects of ultra-luxury ships, Seabourn Odyssey will accommodate 450-guests with the same personal feel and relaxed ambience of her sisters, Pride, Spirit and Legend. The intimate lounges with open-bar policy, the water sports Marina, all-suite accommodations — 90% with private verandas, a luxurious two-deck spa, numerous pools and outstanding choices in dining including menus by the renowned chef Charlie Palmer. But perhaps, best of all, her service ratio remains the highest at sea. The Restaurant – traditional dining and is open for breakfast, lunch and dinner with menus by celebrity chef Charlie Palmer. Restaurant 2 – an intimate, contemporary restaurant with innovative tasting menus and wine pairings. Then succumb to temptation. Step into the stunning two-deck spa with its soothing waterfall, sweeping views, intoxicating aromas and contemporary setting of serene minimalism. Slip into the thalassotherapy pool and let water work its magic. Relax under the soothing hands of our certified massage therapists. Indulge in a collection of treatments from ten Eastern cultures – everything from the Chinese art of reflexology to the ancient art of aromatherapy. Experience the healing properties of warm stones, seaweed wraps and rejuvenating massages. Or add the caressing touch of an ocean breeze with a treatment on a private terrace while you gaze out to sea through half-closed eyes.